Come celebrate the birthday Rachel Taft, an amazing woman who opens her home to touring bands from across the country, and help her raise money for her amazing organization, Feed The Scene!! The Evokatones (MD) - DIY Reggae/Soul/Ska!!! The Evokatones were brought together through an intense love of reggae/ska music and the shared vision of creating a classic, yet fresh sound that undeniably stirs the soul and moves the masses. With an energetically exciting, interactive live show, solid musicianship, conscious yet catchy original tunes, well-known covers done with their own signature flare and one of the most talented female leads in the genre, this 7-piece rocksteady powerhouse has an impact that is evocative and fun, making them one of the most enlivening acts in the DC/MD/VA area. 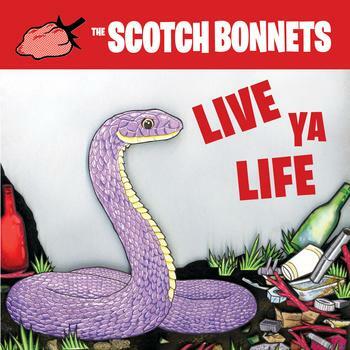 The Scotch Bonnets are the Baltimore/DC cats who always bring the good-love vibe with their funky reggae, rocksteady, and soul-flavored sound. The Thiefs don't follow the rules. The airwaves may be overrun with rock 'n' roll zombies, but this band has devised a plan to steal your hearts and minds while blasting open your ears with guitar rock goodness, a groovy, punch-filled rhythm section and hooks so catchy you'll want to sing them in the shower tomorrow. Feed The Scene supports local and touring music, check us out!